Around 2:45 am on the 6th January Free State Commandos, led by Zacharias de Jager attacked Wagon Hill and were successful in forcing the piquets of the Imperial Mounted Infantry back from the brow of the hill. There followed a desperate two hour battle in the dark and in broken terrain with both sides having difficulty distinguishing friend and foe. By daylight the Boers had managed to establish a good hold amongst the rocks and boulders on Wagon Hill while the arrival of British reinforcements prevented any further movement. Never the less the Boers managed to hold onto this position all day despite the increasing numbers of British opposing them and it was only around 17h00, in pouring rain and hail that a bayonet charge across a hundred yards of open ground by the Devonshire Regiment finally dislodged them. This memorial was erected in memory of the officers and men who fell during the bayonet charge across Wagon Hill on 6th January 1900. 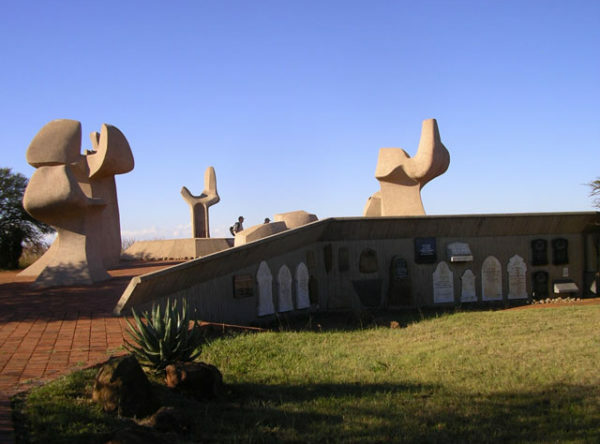 This monument is erected in memory of the men killed during the Battle of Wagon Hill. The men are buried in the cemetery on the north slope of the hill which has to be accessed from the road into Ladysmith. This granite monument was erected at the request of British Soldiers to honour Rev (Dominee) John Daniel Kestell. On 6th January 1900 during the Battle of Wagon Hill, Rev. Kestell moved between the dying and wounded of both sides, giving comfort and first aid for 16 hours. His young son Charles, a prisoner of war, died of enteric fever in Tin Town Camp in 1901 at the age of seventeen. Rev Kestell died on 9th February 1941. He is buried in the Women’s Memorial in Bloemfontein.